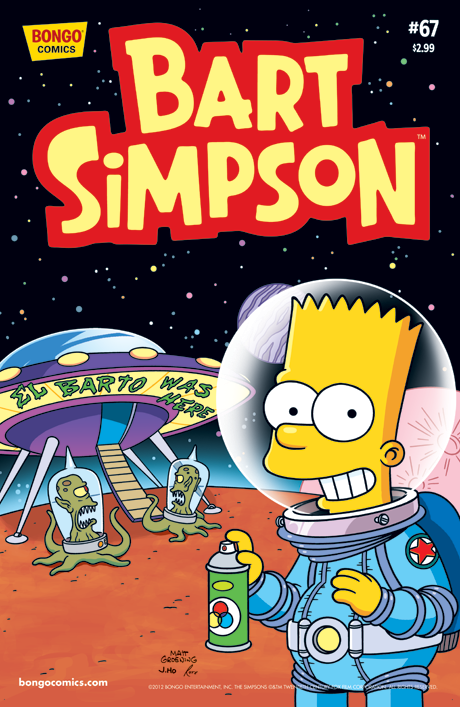 Bart Simpson 67 is the 67th issue of Bart Simpson Comics, released in January 25, 2012. Bart proves an old wives' tale true: If you make a face, it might stay that way. Bartman (aka Bart) and Radioactive Man (aka Rainier Wolfcastle) team-up for an adventure that's out of this world - and off this planet! Marge and Maggie go shopping, and Maggie shows that she's a real chip off of the old block.